Strictly speaking I read most of this book in 2017, but it’s the first one I’ve finished in 2018. 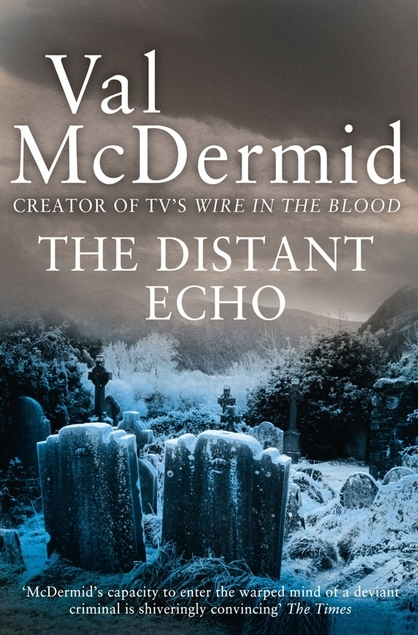 The Distant Echo by Val McDermid is the first in her Karen Pirie series, but she doesn’t turn up in this book until nearer the end of it when she’s been given the task of investigating a cold case going back 25 years or so to 1978. The action begins in St Andrews, Fife, around the Christmas holidays where four male students are out celebrating at a local pub. It’s freezing and snowy and on the way home they stumble across a woman who is breathing her last in the snow. She has been stabbed and there’s blood everywhere. The local police seem determined to pin the murder on the students who are almost locals and are known as ‘the lads fi’ Kirkcaldy’, another town in Fife about 20 miles from St Andrews. The ‘gentlemen’ of the press are quick to be judge and jury, so suddenly the four witnesses are suspects and everyone is turning against them. The action moves on to 25 years later when the ‘lads’ have settled in their various occupations, but the past catches up with them unexpectedly and the nightmare begins again. This is the first book by McDermid that I’ve read, apart from her Jane Austen re-write of Northanger Abbey. I was quite surprised by it, mainly because I had it in my mind that her writing would be a bit more cerebral – silly of me really as probably if it was then her books wouldn’t sell as well as they do. I found this book to be just an okay read, I’ll probably give it three stars on Goodreads, but I suspect that most of my interest in it depended on me living close to all the locations and knowing the areas involved so well. McDermid even mentions a woman that I knew when I lived in Kirkaldy and she has her characters walking around so many of the local roads where I lived until recently. I really had to suspend my disbelief towards the end of the book and I don’t think it’s fair when an author withholds information from the reader in the way that McDermid did – but maybe that’s just me being picky. I’ll probably give the next one in the series a go to see if the Karen Pirie character grows on me, but so far McDermid has been a bit of a disappointment. There are quite a few interesting bookish articles in this Saturday’s Guardian. You might be interested in reading le Carre on le Carre from the Weekend section. I think we have all of his books but I have yet to read any of them. If you’re a fan of Val McDermid you can read an article by her here. There’s an article on Ann Patchett here. There’s an article about a biography of Beryl Bainbridge here. There’s an article on a book about Monet’s waterlily paintings, read it here if you’re interested. I have a feeling that most bookish people are inclined to be shy, as I am, so if that describes you too you might like to read this article – Shrinking Violets: A Field Guide to Shyness by Joe Moran. Josephine Tey A Life by Jennifer Morag Henderson was published in 2015 and I borrowed it from the library. I was really surprised when I saw how thick the book is, it’s 426 pages including the index and I did wonder how somebody had managed to write so much about a writer who was famously secretive about her life. I thought maybe a cache of until now unknown information had come to light somehow but apparently not. In fact by the end of the book I didn’t really know much more about Tey than I had before I set out to read it. Henderson writes a lot of pages about Tey’s father’s business and how it grew, not really something of great interest but it pads out pages I suppose and it’s information easily gained through local council records. There’s an awful lot of speculation about possible World War 1 romances, Henderson seems determined to give Tey a tragic romantic history but really there is no evidence that any man was any more than a friend with an interest in poetry. It would seem that while Tey was in Inverness (most of her life) she kept herself to herself. Her family seem to have had a bit of a chip on their shoulder about the family being in trade, the father was a successful fruiterer and they seem to have thought that they were rather looked down on by some sections of the community. But the three daughters in the family were sent to a private school and I can just imagine the locals thinking that the local board school was good enough for most of them, why not for the Tey family. It inevitably sets you apart if your children aren’t sent to the ordinary local school. Tey was one of those Scottish people who couldn’t wait to get out of Scotland and she suffered from an inherited snobbishness which must have made life in a small Highland town such as Inverness a real pain for her. She sought to anglicise herself in that mistaken belief that some people had/have that ‘English’ meant superior. She was proud of having English ancestors, when most people would probably have hidden that fact. The sad fact is that for most of Josephine Tey’s life she was stuck in a town that she didn’t like much with no friends there and having to run after her elderly authoritarian father, while her two younger sisters left Inverness for England and stayed down there. She must just have lived for the times that she managed to get away down south to stay with friends or visit publishers. This book is more interesting for the information about Tey’s way of writing and the background to her books and the plays written under the name of Gordon Daviot. I think it’s fair to say that Tey had rather an immature attitude to her work and was quite willing to cut off her nose to spite her face when it came to her relationship with the BBC. She was very precious about her writing talent – too precious maybe. If you enjoy Tey’s writing you’ll definitely want to read this book although for my liking there is far too much emphasis on her extended family, particularly when you consider that they could not be described as being a close family. I didn’t really need to know that Tey’s father Colin had an ostentatious gravestone put up at his parents’ grave – a sure sign of a guilty conscience, he was ashamed of them and their Gaelic heritage and seems to have kept his own children away from them. What a shame for all concerned. 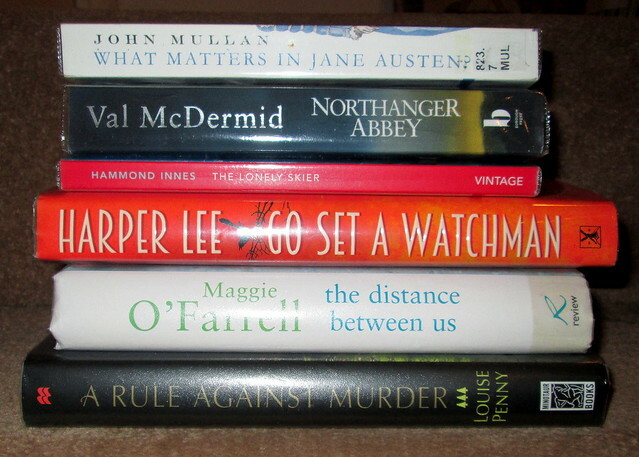 I rarely get a chance to chat about books I have read with actual friends instead of blog friends. But as it happens Eric had just read this one and we were of the same opinion, it didn’t tell us much more than we already knew about Tey. Eric mentioned that as Tey was obviously a lesbian he can’t understand why Henderson should be so determined to avoid that fact. I have to say that I agree completely. Tey did have lesbian friends and when propositioned by one of them she rebuffed her. But I would say that the reason for rebuffing her was probably because the woman was the partner of Tey’s friend and had a reputation as a philanderer, causing her partner grief. Tey would have to have been a fairly despicable person to have an affair with her friend’s partner. Tey at the time was fond of wearing masculine clothes, including shirts and ties as well as mannish jackets (see the book cover) – enough said. However Tey was of a religious bent so it’s probably something that she struggled with. It certainly goes a long way to explaining why Tey had such a horror of publicity and journalists. As it happens I am also the daughter of a fruiterer and if I had ever become famous I would have found it bizarre if anyone had shown any interest in where my father’s shop was, or his relationships with his extended family. If you’re a fan of Tey’s writing though you will definitely want to read this book. There’s a short introduction by Val McDermid. I read this one as part of the Read Scotland 2016 Challenge. 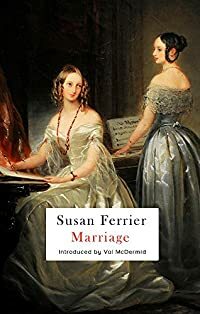 Northanger Abbey by Val McDermid is one of those rewrites done by contemporary authors to celebrate the 200th anniversary of the publication of Pride and Prejudice. I enjoyed this one more than Alexander McCall Smith’s updated Emma. McDermid chose to change the setting to Edinburgh during the festival, giving herself plenty of scope to create an interesting and vibrant background for Cat (as the modern Catherine Morland styles herself) and her friends. Cat is the daughter of a Church of England vicar and she lives with her family in Dorset. When a wealthy neighbour and his wife Susie offer to take Cat to Edinburgh for the festival she jumps at the chance. Cat has been home schooled and now that she is 17 she’s at a loose end, having no qualifications to get into college and having no idea what she wants to do with her life. She lives through novels. Cat and Susie have a great time in Edinburgh, with Cat determined to see as much of the place as possible, taking Susie to places she had never been before, despite her being a festival regular. They are invited to the Highland Ball, it’s the social event of the festival and Cat has to go to dancing lessons to learn Scottish country dancing. She’s paired up with Henry Tilney, he’s been to many a highland ball and he helps out at the dance school when they’re short of male partners. Henry’s father is a retired general and has his three children in an iron grip of strict discipline. When Cat is invited to Northanger Abbey, the Tilney family home in the Scottish Borders, its Scottish baronial architecture coupled with Cat’s obsession with reading vampire/zombie fiction fuels Cat’s imagination. To make matters worse the abbey is a complete no signal zone for mobile phones and the general rarely allows the router to be switched on for the internet. Cat is completely out of her comfort zone. As you would expect, nothing goes smoothly for her. Val McDermid name checks quite a few female writers in the book and annoyingly she starts it off in the Piddle Valley, Dorset and has a few daft/amusing village names along the same theme. Unfortunately I never did get around to writing a story featuring Piddle and surrounding daftly named villages as I said I would when we drove past a roadsign which pointed to Piddle when we were in England a while ago, I’m sure that Piddle wasn’t in Dorset though. Anyway, this book is well worth reading, it’s a successful rewriting of Northanger Abbey and it’s the only book that I’ve read by Val McDermid. I somehow don’t think I’ll be reading any of her other books as I’m told they’re quite gruesome. We’ve been fairly busy since Peggy flew in from Pittsburgh on Wednesday, but today we had a lazy day after such a tiring one on Saturday when we went to the antiques fair at Ingliston in Edinburgh and also to the huge booksale at St Andrew’s and St George’s church in Edinburgh’s George Street. If you’re in the city you should look in there, it continues until the end of the week I believe. So today I had time to catch up with the Guardian’s Review section, here are a few articles which I found interesting. In this article some well known authors write about the children’s books which shaped their imaginations. I was really interested in this article by Julia Blackburn about John Craske, a little-known Norfolk artist who turned to embroidery in later life. You probably heard that the crime writer Ruth Rendell died during the week. Jeanette Winterson and Val McDermid write about her here. On Friday we went to visit the crime writer James Oswald on his farm in Fife and he was very generous with his time, showing us his sheep and Highland cattle. I hope to have some photos from that visit to show you soon.